Data company Fluent released the results of an online survey in which 1,900 people were queried about their online listening. The result sketches a picture of rampant adoption of music services, especially by young respondents. 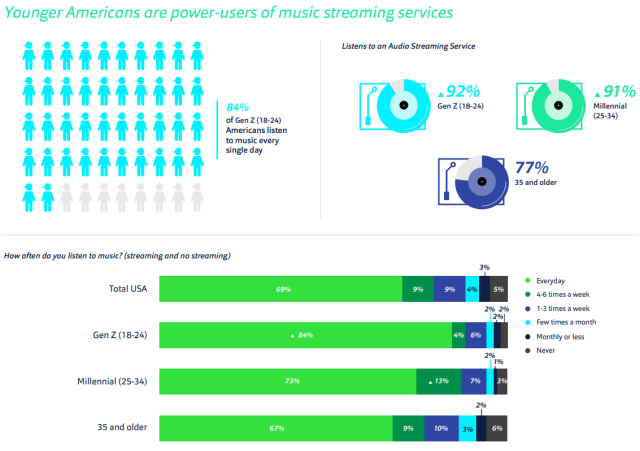 The research results are broken out by age demo primarily, and show Gen Z (18-24 in this study) and Millennials (25-34) as most numerously taking up audio streaming services (92% and 91% respectively). Respondents older than 35 are also majority adopters at 77%. Interestingly, music subscriptions are portrayed as popular, with one in four Americans extrapolated to subscribe to a paid service. In that break-out, Apple Music and Spotify lead the pack. On both those platforms, younger users buy in much more than the over-35 crowd. In fact, in every service tracked, the above-35ers were the least adoptive group. “Gen Z and Millennials are far more likely to pay for audio subscriptions,” the report states. What induces people to sign up? Ad-free music is the top driver, followed by the range of artists available. When asked about features that are most important to users, offline downloading and storing is tops. The study summary can be viewed free of charge HERE.